I actually got this deluxe toaster oven after three failed attempts at a Kitchen Aid toaster. The Kitchen Aid toaster was the first “fancy” toaster I ever bought, and it was terrible. It broke three times, from the same defect, in a three year period and after the third replacement, I decided to let Kitchen Aid keep its overpriced, defective toaster and opted to try something new. 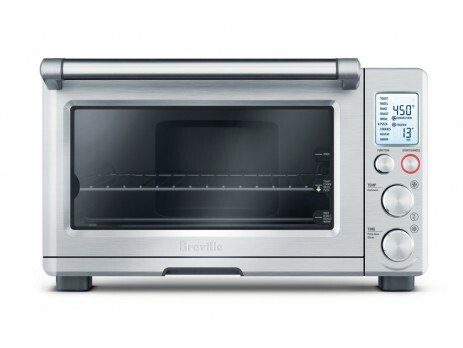 Knowing we were about to move into a smaller space and being keen on having the ability to use a smaller oven for smaller portions anyway, I looked into toaster ovens and eventually settled on the Breville Smart Oven. It toasts bread (and bagels! ), roasts, broils, bakes, has a pizza setting and a few other settings as well. You can easily adjust all the functions and it has a convection setting that can be turned off and on depending on what you are baking. I am an avid cook and baker and bake all my own breads.I was walking the other day and started thinking about how homes listed for sale are described in print. I was specifically thinking of the way that you sometimes see homes listed as including Five Appliances. (Sometimes you see numeric variations on this theme, but five is a number I see a lot). Anyway, I began thinking about our home and what appliances it contains…since it’s a home under 200 square feet, I was considering which of our appliances have made it a resoundingly pleasant 200 square feet to live in. To celebrate the end of our first year in our little house, which coincides nicely with the end of 2011, I’ve compiled a list of the Five Appliances that I think have contributed to a successful year living in a small space. If you are considering outfitting a small space, be it house, travel trailer, in-law apartment, or just a smaller sized kitchen, I hope you will find this useful. We also routinely bake pizzas in this oven. The pizza function is nice. I have a thirteen inch baking stone that I like to bake pizzas on and this stone does fit into this oven. Barely, but it does if I want it to, and the door closes fully. Wow. That’s amazing! You can also choose to bake on the pizza pan that comes included with the oven. The pizza setting includes subsettings for frozen or fresh dough/pizzas and has an inbuilt time and temperature suggestion for each variety that you can easily adjust according to your own preferences.My biggest concern about moving into a small space was being limited to a large toaster oven for all my baking needs. But I’ve been really pleasantly surprised by the Breville. I can fit two two pound loaves of sourdough bread into the oven at a time to bake (though they come out more perfectly shaped when I cook them one at a time). The oven can hold 450 degrees beautifully, and while the baking space is indeed snug for two big loaves, they bake evenly and turn out beautifully. There’s no steam injection, but tossing a bit of water in the base works well to give me a lovely, caramelized crust and I’ve been really happy with the way this oven has performed. Broiling works beautifully as does baking and roasting. The bagel setting I have not used, but I use the toast setting every day. I like that you can choose to toast 2-6 slices at a range of darkness, depending on what you like. You can adjust the oven rack to various heights inside the oven, which is handy if you are baking bread or other tall items like whole squash. I can’t say much against this little workhorse. It’s much more pricey than a toaster oven, but in this case, you aren’t buying a toaster oven so much as a small oven. This has been an excellent investment. It functions beautifully on every setting, it’s quiet and small and attractive with a stainless finish. It’s sturdily built and in a year and a half of at least once daily usage, I haven’t had a single problem with the machine. I give this gem a five star rating. I think the Breville Smart Oven would suit a variety of people’s needs and can’t recommend it highly enough.